It is simply astounding how climate skeptics have gotten cornered into such a tiny fraction of disinformation space that they must exhume 20-year old models to vainly poke holes into the current scientific literature. Hence, McIntyre and his clique can’t get over Mann Bradley and Hughes (1998, 10 years old), and a lot of those who have no clue about GCMs think it’s fair game to throw dirt at Hansen’s GISS model predictions (1988). Meanwhile climate scientists have moved on : some results have survived, some have not, but the basic result remains – AGW is real, no amount of disingenuous PR will make it go away. Given the simplicity and low resolution of Hansen’s 1998 model (which didn’t have anything remotely close to an ENSO, for instance), it is indeed remarkable that it was able to predict the temperature of the next 20 years to such accuracy. What the Skeptics keep missing (Mr McFarlane in particular) is that numerical modeling and computer power have done quite a bit of progress in the past 20 years, and no climate scientist is retarded enough to be hanging their hat over 1988 results. Sure, there still are legitimate questions concerning the relative importance of natural vs anthropogenic climate variability, some of which have implications for policy initiatives, and that would deserve healthy debate. Yet the Skeptics are so blinded by their political prejudices that they keep fighting old windmills. had figured it out over a century ago), and that a good radiative transfer code (which is what the GISS model is known for) is enough to produce credible global temperature trends given a realistic forcing. Current GCMs are now focused on getting the regional scales right – that’s where the money is, and intelligent skeptics (I heard there were some) would be well inspired to get out of their rut and on board that train. If they keep whining at the 1988 stop we soon won’t be able to hear them. Or is it that there just isn’t any stone left for the AGW skeptics to hide ? Wow Julien! So many comments in such a brief response, but, unfortunately, liberally sprinkled with remarks such as disinformation, disingenuous, retarded, prejudices, etc. Nevertheless, I shall try to respond in a more rational manner. Scenarios B and C don’t diverge until after 2006. Results so far are close to both B and C. In a few more years we’ll see if temperatures now stabilise (scenario C) or continue to increase (scenario B). I agree with Tim, but my chart below shows that what looked to be a reasonable fit with Scenario B in 2006 does not look very good in 2008. 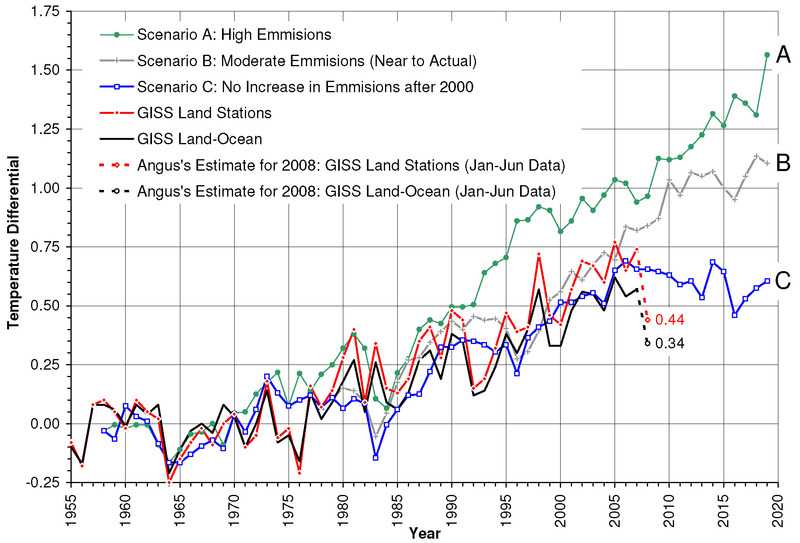 It is early days yet, but it would appear that our planet is following the zero-emissions Scenario C.
From the foregoing, I contend that it is reasonable for me to comment on Hansen’s 2006 papers and posts in this blog without being accused of exhuming 20-year old models. Julien, perhaps you should target your responses at Jim Hansen. He was responsible for the initial exhumation of his 20-year old models. I thought that McIntyre & McKitrick (M&M) did a well-balanced due-diligence on MBH98. Furthermore, despite more recent papers from the “Hockey Team” over the last 10 years, it would appear that M&M’s core conclusions still stand, namely: “no bristlecones, no hockey stick”. Incidentally, the MBH98/M&M discourse was one of the reasons why I began to doubt the AGW hypothesis. AGW is real, no amount of disingenuous PR will make it go away. Perhaps, but AGW is still currently a hypothesis. It has not yet been raised to a law of physics. Thank you for the Wikipedia link, but I didn’t need it. Nevertheless, I was half expecting a response stating that one of the reasons for the temperature drop in 2008 was that 2007-2008 was a La Nina. A large part of my day job involves running complicated computer models and, therefore, I am well aware of the increased computational power available and the evolution of current GCMs. However, the GCMs that I am aware of “…don’t do clouds very well”, which may lead to incorrect temperature predictions. I wouldn’t call Jim Hansen retarded for exhuming his 1998 model, but, if you so wish; it is your choice. I am well aware of Arrhenius’s work, but it would appear that this one should also be sent to Jim Hansen, because it refers to his exhumation of his 1988 models. I agree. In 2007, my company employed Weather Intelligence, UK, to carry out research for us on regional climate variability and operational climate prediction.